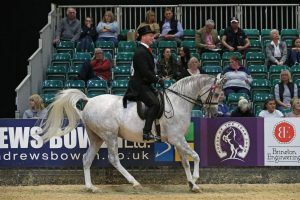 All 17 entered horses came forward for the Ridden Arabian of the Year class, kindly sponsored by Simon Constable Equine Vets and Mr and Mrs Roberts, to be judged by Ms Stephanie Turner and Mr Mark Gamlin on the opening day of 2018’s Horse of the Year Show (HOYS). The atmosphere in the TopSpec Ring was somewhat more sombre than usual, the recent loss of last year’s Reserve Champion and multiple Supreme Champion Vartanii (Sisyrinchium x Asifa Alsara) suddenly felt raw again, and another more recent and devastating loss for the Arabian showing community and it seemed to echo in the hearts of competitors and spectators alike. Ultimately, in true British fashion, the show must go on and it would prove to be a strong class with several possible winners. As usual, the go-round was split into two groups who followed one after the other to give each combination a fair chance of showing their horse off to its fullest without running into the back of anyone else. Overall, most riders were able to find a space and it was one of the more pleasant of the week’s classes to watch while moving together. However, each group had a moment or two of excitement, including a couple of mistimed blips in front of the judges that were unfortunate for all involved. After each group had done their go-round, the second group stayed in for their ride to be assessed while the others stripped their horses off outside in the collecting ring. The ride judge’s show began with an extension and then tested the brakes in a change of rein through trot where each horse had the opportunity to showcase their schooling and obedience with how easily they coped with a quick rebalance before moving back up into canter and then back down the paces to finish. 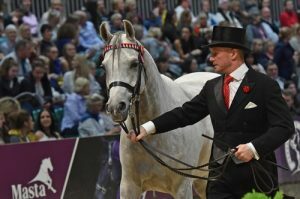 It was a short, deceptively tricky show for the HOYS class of 2018 that asked all the right questions for a championship event. While Stephanie Turner assessed each horse for its ride, Mark Gamlin was able to see each horse without its saddle to fully look at the its conformation and movement in hand. None of the horses seemed overawed or concerned about standing next to the stands, even when spectators inevitably moved rather quickly or dropped things, creating loud and unpredictable noises. The manners of the horses was overall very pleasing and it looked to be a battle for the higher places. Once all of the horses had been judged, there was a tense wait while the top nine were called out in reverse order, a departure from the previous top 11 initial pull in catalogue order and then the top nine in reverse. In 9th was Tender Kkiss (Ruger AMW x Kkiss of Gold), a six-year old bay mare ridden on this occasion by Karen Johnson and owned by Edwina Warner. Bred by Edwina and Rick Warner with Domenica Fitch, Tender Kkiss picked up her HOYS ticket at the Royal Cheshire Show and has been a consistent winner this year, having won the British National Championships (BNC) Mares at the AHS Nationals and became eventual Reserve Supreme of the three-day show with producer Clare Fitch. Eighth place went to Keeley Grayson’s attractive six-year old gelding Lysander ZB (Orion OS x Lanehyar ZB), bred by Brian and Zena Bermingham and ridden by Darren Crowe. They qualified at HoCon this year and he looks to have a bright future ahead of him. Owner-rider Ben Hester and his smart chestnut gelding Sameon Mahrouhk (Mareschal x Sharinaah) took seventh place this year after qualifying at the AHS National Championship Show. The 12-year old, bred by Mrs S Wilkinson, looked to give a good ride and equalled his result from last year. In sixth place was CS Lelisha (Krown x G Lilja) who looked to give a very comfortable and easy ride. 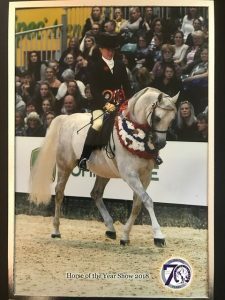 The nine-year old grey mare was ridden by Kirsty Nelson and qualified at the Northern Arab Horse Show for owner Len Morgan and breeders Mr A & Mrs J Davis. Moving up into the top five and tensions were starting to build. There were 12 horses yet to be called forwards and only five places left. Jacqueline Fisher’s Crystal Ora Sheen (Orashaan x Crystal Sheen) took the fifth place rosette on this occasion. 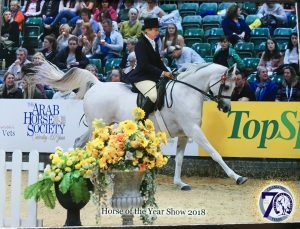 Bred and ridden by Louise Maryon, the 16-year old grey mare qualified for HOYS 2018 at the North Staffs Arabian Horse Show. Sharinaah (Kais x Sherruka Al Roban) took fourth place this year, owned by Isabel Grey and expertly piloted by David Froggatt after winning the championship at Stoneleigh Horse Show to earn her ticket. 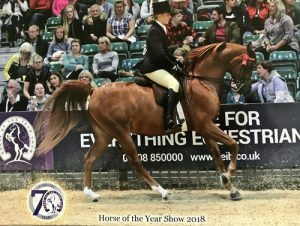 In her last appearance at HOYS in 2016, the 15-year old chestnut mare won this class and has a host of titles to her name, including winning the inaugural RASS Championships in 2014. Bred by Mrs S Felix, Sharinaah is the dam of Sameon Mahrouhk, the seventh placed finalist in 2018. On to the top three, and third for 2018 went to the six-year old chestnut gelding Cipriana (Mascot des Alpes x FS Cinderella) bred by Joanne Lowe and Chris Lower. Rider Jade Hateley took the ticket at the Royal Bath and West Show for owner Tracey Hateley, and this combination took the BNC Gelding and BNC Open ridden titles at this year’s AHS National Championship Show. Second place and reserve champion went to Signet (Adawy x Om El Shabrina Dream), bred and owned by Judith Powell and ridden by Louisa Biles. 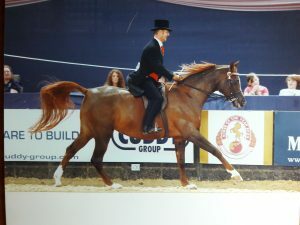 Louisa rode Signet’s sire, Adawy (Borneo x Ashiqa) to become HOYS Arab champion in 2013 and it appears as though Signet may be looking to follow in her father’s illustrious footsteps. This six-year old grey mare qualified at the Royal Norfolk Show and has been well placed in qualifiers all year. 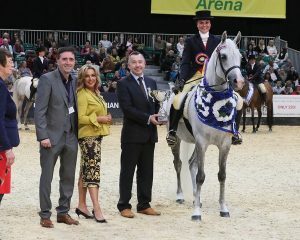 This year at HOYS, Signet also received the Beruga Perpetual Trophy for finishing as the highest placed mare, as well as receiving £160 in prize money. The Horse of the Year Show Champion for 2018 was called forward: Aja Giuliano (Aja Angelo x Sahina) and Clare Fitch riding for owner Susan Robinson. Bred by Aja Arabians, this grey gelding is only six-years old and already has some impressive results to his name, most recently winning the Supreme Purebred Championship at the British Arabian Championships. As well as the championship title and £210, this combination received the Elustarius Perpetual Trophy for highest placed gelding and the Arab Horse Society Umm Quam Perpetual Trophy. 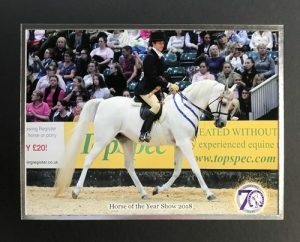 Aja Giuliano qualified for HOYS at the Devon County Show and this victory marks Clare’s fifth Championship win at the Horse of the Year Show; 2002 with Vicky Marsh’s Johara el Kheil (India x Indian Serena), 2012 and 2015 with Eddie and Rick Warner’s Patros HB (Psytadel x Padisha ibn Estopa), 2017 with the Hon Mary Ann Wragg’s Mirv (Psadisho ibn Esstashan x Mirwana II), and now 2018 with Susan Robinson’s Aja Giuliano. Congratulations Clare! Although the remaining seven horses were not placed on this occasion, they all looked fantastic and many of them could easily have been placed. The recipient of the Cantsfield Perpetual Trophy for the highest placed stallion was Jacqueline Hall’s impressive nine-year old grey stallion Bey Dayaan (Ganemede x Gold Dayahla), bred by Mrs C M Cooke. Bey Dayaan qualified for HOYS at the AHS National Championships with David Froggatt, but was piloted by Kirsty Aird on this occasion. For Aja Giuliano, the week’s work was not over and he faced a four-day wait to compete in the Supreme Horse of the Year on the Sunday evening against champions from the other sections. The preliminary judging took place in the TopSpec ring on the Sunday afternoon, where Clare and Aja Giuliano produced one of the smoothest shows of the day and captured the attention of the judges which proved to be an accomplishment in itself. Our purebred Arabian representative showcased the breed to perfection; he never put a foot wrong despite a trolley rattling past the stands during his show and the next champion almost walking into their path. He stood quietly and attentively and represented the breed to his fullest. In the final judging in the main arena, Clare was able to keep him in his own space, although they were unfortunately cut up by another, much larger, horse just in front of the judges which caused a slight blip in an unfortunate place. Although sad to see, Clare was able to help him focus once again and he coped very well, especially for a six-year old. Meanwhile, in the Supreme Pony of the Year Championship, the title went to the Part-bred Arab Champion, Carmen’s Novello (Chiddock Stop Watch x Wilderness Carmen), a five-year old bay gelding ridden by Lucy Glover, owned by Charlotte Read and bred by Mrs W Edgar. This was a fantastic achievement and encouraging to see a part-bred Arabian pony come through the part-bred class to win the Supreme Pony title. With the performances that came from the such young champions, Carmen’s Novello and Aja Guiliano, the future of Arabian horse at the Horse of the Year Show should remain safe for years to come. Congratulations to the HOYS Championship class of 2018 and many thanks to Simon Constable Equine Vets and Mr & Mrs Roberts for their generous sponsorship.